I have set up this blog to record my bird and general wildlife sightings in the 5 mile radius of my home. This includes my local patch - New Hythe/Leybourne Lakes. This is an inland area of West Kent, a few miles from Maidstone. I rarely stray more than a few miles from this area these days. I live in a village called Birling which is at the foot of the North Downs and about 1.5 miles from New Hythe. A quick 45 minute visit between 4.30 and 5.15 today, I was hoping for some butterflies as the weather had brightened up after a dull and misty day. All I saw was a distant 'white' - probably a female Orange Tip but too distant to be sure. 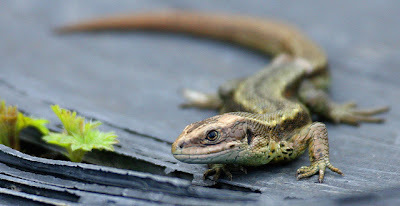 I saw my first Common Lizard of the year as well as 3 Slow Worm and 2 Newt Efts. hey steve nice Lizzard photo. I thought i'd done well with the snake ! I still have a bit to learn. Great lizard pic Steve! Which lens did you use?